My God, What Have We Done? 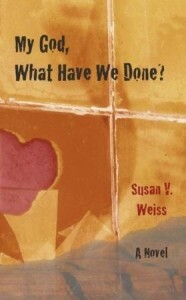 by Susan V. Weiss combines two seemingly divergent topics under one roof — a marriage and the making of the atomic bomb — and readers get to watch it build to a crescendo and explode. Told in first person point of view, readers get a real taste for how obsessed Pauline is with Oppenheimer, so much so that her honeymoon with Clifford is spent in Los Alamos where the atomic bomb was created. This is where readers first meet them, and may be stunned by the emotional distance between the newlyweds. As the story begins unfolding, Pauline continues to exhibit emotional distance, as if she is disconnected from her feelings and every moment of her life must be plotted and thought out thoroughly before she acts. The stories of Pauline and Clifford’s marriage and how it builds is in parallel to the third person POV tale about the building of Los Alamos and the atomic bomb. While Weiss uses an interesting premise, particularly the bomb itself to signify the creation of relationships and families and their destruction, the first person POV of Pauline’s life is more captivating. She’s pulled between her desires to be a wife and mother and her old life, feeling a disconnect from her friends and life in Philadelphia, but there is a greater desperation within her. While Clifford is often compared to Oppenheimer by Pauline for his angular facial features and his bookish intelligence, she acts more like the scientists as she parents her son. Like the atom bomb they created to end the war — all wars — Jasper is an experiment to be tinkered with and nurtured. Readers will often question Pauline’s emotional state and whether she has the depth necessary to care for a child, herself, and her husband. She’s an enigma, much like Oppenheimer was. Readers easily find the parallels in this narrative, but Weiss’s characters appear to be more like caricatures of people, rather than complex human beings. My God, What Have We Done? by Susan V. Weiss is an attempt to draw wider conclusions about logically minded people, and will prompt readers to self examine. However, the struggle through the shifting points of view and story lines may bog down some readers’ enjoyment of her tale. Ultimately, the premise was unique, and the struggle of a new housewife was interesting, but the Oppenheimer sections were a bit dry and read like a laundry list of encounters rather than a fictionalized account of true events. Please check out the rest of the stops on the TLC Book Tour by clicking the tour host icon at the left. 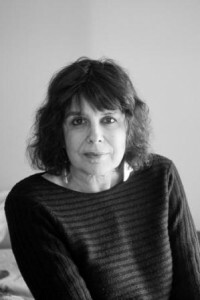 Susan V. Weiss is a writer and a teacher who lives in Burlington, Vermont. Her stories have appeared in literary magazines and anthologies. In addition to teaching adult literacy and expository and creative writing, she has initiated community-outreach writing projects for offenders, refugees, and homeless people. This is my 56th book for the 2011 New Authors Reading Challenge. I’m not sure this is for me but it does sound oddly intriguing though. Susan, I’m glad that you are getting favorable reactions. Thanks for reviewing my book, Serena. Of course I’m disappointed that you found it lacking in some ways, but I’ve been fortunate in getting favorable reactions as well. It seems like a lot of ideas these days are overplayed, and this sounds like a new and unique storyline. Too bad it didn’t work better for you! I wish it had worked better for me. I’m glad I passed on this because I think it would have been a bit too dry for my tastes right now, but it’s sort of unusual enough that I’m keeping it on my TBR. Thanks for the honest review. It is unusual, but it just didn’t work for me. I think the parallel between building a bomb and building a marriage and family is interesting, but it sounds like it could have been executed better. Maybe the scenes with the scientists weren’t totally necessary. I like the parallel, but there were a number of issues with this one that gave me a hard time while reading it. The main female character is very disconnected to her emotions, and the science sequences can be very dry at times. The storyline does sound unique, and a little bizarre. I’ll have to think about this one.